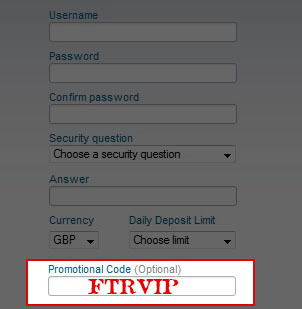 Although no codes are necessary to receive bonuses at William Hill, you should still enter the William Hill promotional code FTRVIP when you make your account. Enter this code in the field marked “Promotional code” when you sign up at William Hill to make sure that you qualify for all the normal benefits as well as any FTR-exclusive promos that are offered. Ticket is granted as soon as deposit is made. Ticket is cleared when 85 WHPs are earned. Must be earned within 7 days of deposit. Use on any tables £0.05 – £0.10 and lower. €7 and $7 also offered. 2 tickets to SnG Ladder 1. 1 ticket to a €1 Twister SnG. 1 ticket to a Wild Twister SnG. Tickets expire 7 days after issue. Tickets are given immediately on deposit – no clearing requirements! Required to earn WHPs to clear, released in £5 increments. The first £10 of the bonus requires 280 WHPs per £5 release. The remaining £90 of the bonus requires 350 WHPs per £5 release. 6,860 total WHPs to clear the full amount. Bonus must be cleared within 45 days. Free spins only valid on the casino side games section of the poker client. Free spins must be used within 14 days of issue. Any winnings from the free spins are subject to a 40x wager requirement. Winnings from the free spins are capped at £20. ** Free Spins bonuses are available on selected casino side games only: Adventures in Wonderland, Age Of The Gods, Bounty of the Beanstalk, Cat Queen, Desert Treasure ll, Fairest of Them All, Frankie Dettori’s Magic Seven, Full Moon Fortunes, Funky Fruits Farm, Furious Four, Gladiator, Halloween Fortune, Jekyll and Hyde, King of Olympus, Mr. Cashback, Nostradamus, Piggies and the Wolf, Rocky, Secrets of the Amazon, Sherlock Mystery, Si Xiang, Tennis Stars, The Mummy, The Riches of Don Quixote, The Three Musketeers, The Winnings of Oz, Top Gun, White King, Wild Gambler. Since a total of 6,945 WHPs are required (for the £GBP package), and you earn 14 WHPs for every £1 in rake paid, you will pay a total of £496.07 rake for the full £110 amount. This amounts to 22.17% cashback. While clearing your welcome bonus at William Hill, you’ll begin to accumulate WHPoints. At the same time, you’ll be earning Club Points, which you’ll be able to redeem for cash, tournament tokens and bonuses. The more you play, the higher your club status will be and the more Club Points you’ll earn per WHPoint generated. As you advance in the ranks, you’ll also benefit from special freerolls and points tournaments. 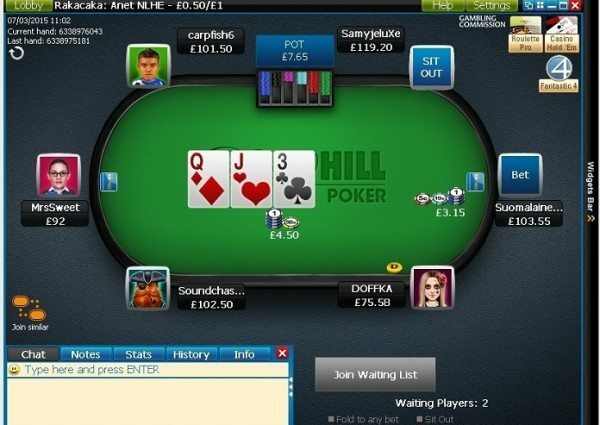 For more details, our William Hill Poker Rakeback review breaks down the VIP club and benefits. For those ready to play at WilliamHill just start the William Hill download with any of the links at the bottom of the page and make sure you enter the William Hill Poker promotional code FTRVIP when creating your account! 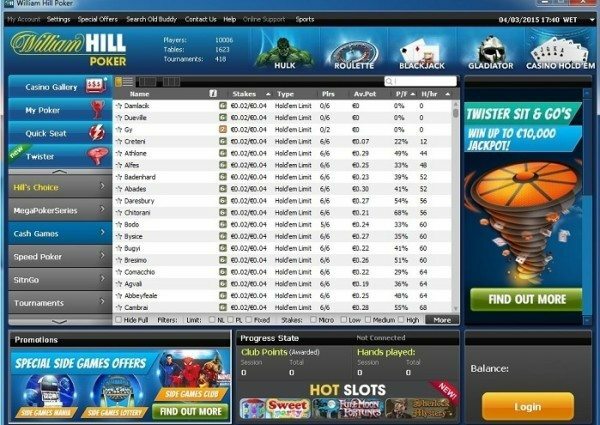 Find another review of the William Hill Poker promo code at gpsts.org. Click here to read about all the available William Hill promotional code bonus offers. Be sure to also get your William Hill Sports free bet, available to all William Hill customers! Read details on the William Hill free bet offer here. Also visit Williams Promo Codes where you can research the details on the best William Hill promotional codes for you!